Overthinking It continues its series of alternative movie commentaries with their take on the Paul Verhoeven classic. I enjoyed The Overview. I somehow managed to listen to it through to the end without watching the film. You definitely did something right. I still have no desire to see the film but this commentary made me laugh out loud more than a few times. We’re incredibly happy that The Overview is returning to the site, with a commentary on Starship Troopers! You can get it in The Overthinking It Store. Yup, the store — we’re charging for these. It costs money to run a site like Overthinking It, and the limited appeal of our subject matter (10,000 words on Dragonball-Z, for example), means we’ll never have the kind of mainstream traffic that allows us to cover our expenses with ads alone. Plus, we want to grow and expand the things we’re able to do, to bring you more and more overthinking in the future. Up to now we’ve asked for donations from our loyal readers, and you have responded with incredible kindness. But we’ve given you nothing in return for your overwhelming generosity. We’re glad that we can now offer you something in return for a few bucks. Don’t worry — the articles the podcast: We’ve got no plans to charge for these. This is a whole new thing. So enjoy, thanks for supporting Overthinking It, and let us know what you think in the comments. We’re looking forward to bringing you many more of these. Awesome! Thanks, guys — I really look forward to hearing this, and honestly, four bucks is a steal for this kind of thing. I love the concept for this, I seriously nearly creamed in my shorts as The Cable Guy would say, if I would pay for a commentary track it would be from you guys, and not just because you’re too obscure to get as a bit-torrent unlike Rifftrax. 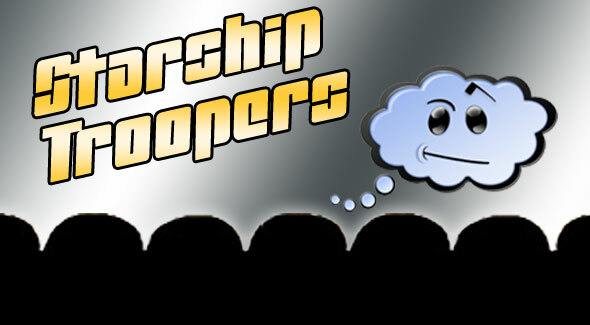 The Starship Troopers track is good, I was hoping for more academic riffing like on These F***ing Teenagers, but there’s some good MST3K moments and I really enjoyed the whole vibe and got a lot of entertainment value from it. FYI: I’ve seen both of the sequels. The second was horrible, and not in a comedic way. It’s practically unwatchable. The production values are incredibly low so it’s hard to tell what’s going on, it seems like it was written while someone was drunk watching the first one, although the plot doesn’t connect really at all. The third one is pretty good. It’s more like a proper sequel to this one, and I think it’s worth watching. I would support a monthly Overview. If you provide these instead of needing donations, sign me up. I loved it. Different take than MST3K and Rifftrax due to the cultural references and discussions. Let’s have more! Anyone else who has bought “The Overview” want to tell us what you thought? I have it paused now to respond. Currently 37 minutes in, and of course I am enjoying myself. I have been a little thrown by a few things though, I am watching it on Netflix streaming and I did not see the Buena Vista logo that was to be the launching point, so I just went with it, and it’s been fine anyway. There have also been a lot of half finished sentences, many of which are followed by a long enough beat of silence that I wonder if I’ve accidentally paused the audio. I know there’s a lot going on while you’re recording these, trying to watch the movie and not talk over each other, what’s really the most painful part about those instances is that I don’t get to hear the rest of the thought! I am entirely open to the possibility that I’m having technical difficulties, even intermittent blindness and deafness! You can’t possibly account for every intro out there and scripting or reenacting the track would kill it, so unfortunately I don’t have anything helpful to say about the problems I’m experiencing, maybe you can overthink something up? At any rate, I’m looking forward to the rest of the track and really hope there’s some overthinking on the use of Mazzy Star’s Fade Into You as the background music for the fist fight scene. The Overviewed Starship Troopers goes well with a big cup of coffee and a lazy Saturday morning. My girlfriend and I are both great fans of this deeply flawed movie, as well as Overthinking It, and are thrilled that these two passions came together. If you’re taking suggestions, I would like nominate Judge Dredd, the 1995 Sylvester Stallone magnum opus – which I am proud to still have on VHS.